Rhubarb (Rheum Palmatum) is used to treat constipation, dysentry, hemorrhoids, portal congestion, pin/thread worms, skin eruptions from faulty elimination, blood in the stools and duodenal ulcers. Mix 5-10 drops of extract in a little water (spring or purified) 2-3 times daily. Shake well. 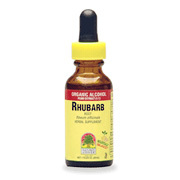 Rhubarb root fluid extract (1:1) 1,000mg, 12-15% certified organic alcohol. Rhubarb Root Extract is shipped in a discrete, unmarked package. Orders are processed immediately and usually take about 3 to 5 working days to be received. We do ask that you try it for 2 to 3 weeks to feel the full effects. Any information received is used only for order processing and shipping purposes. Your information, such as e-mail address, will never be disclosed to a third party.